Eastern Washington offers so many good butterfly areas in July that it is overwhelming for me to cover them all. Some of my favorite areas are Slate Peak, Salmon Meadows, the Sinlahekin Wildlife Area (all in Okanogan County), Tiger Meadows and the forest service roads above Sullivan Lake (Pend Oreille County), Reecer Creek and the Wenatchee Mountains (Kittitas County), Sun Lakes (Grant County), and the Griffin Peaks area of the Blue Mountains (Columbia County). I will address a few of these areas especially those that offer a look at our most rarest or most geographically limited species. The first stop is Slate Peak high in the Okanogan Payseten Wilderness area. 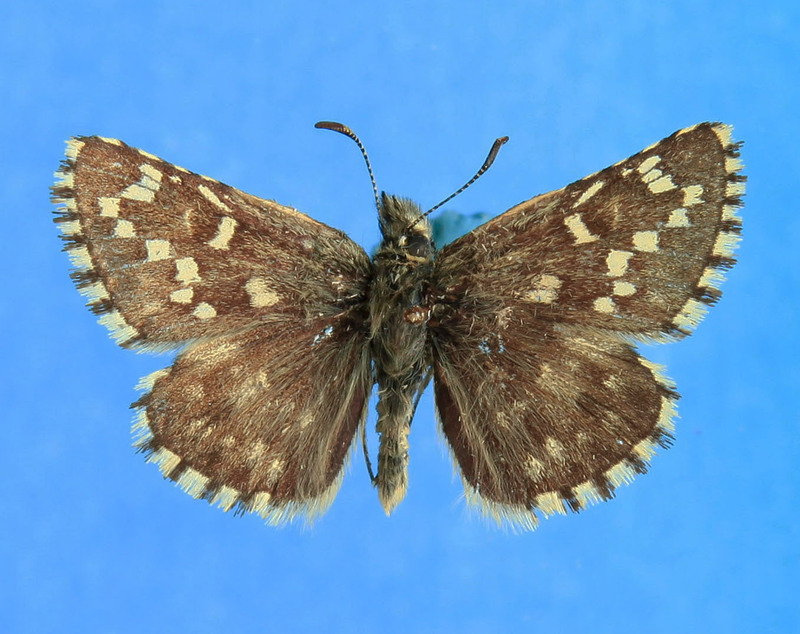 Slate peak is a very special place because several of our most rarest butterflies fly here. This area is our best access to this unique wilderness area of natural beauty. One can drive to 7,000 feet elevation and walk the ridges and meadows of this high country. To reach Slate Peak take the North Cascades Highway from Burlington across the passes to Mazama. The alternate way is by way of I-90 across Snoqualmie Pass then up to East Wenatchee. From there head north to Winthrop, then west to Mazama. From Mazama take the gravel Hart's Pass road to Hart's Pass (high clearance vehicles are advised). From Hart's Pass take the road to the end (Slate Peak). 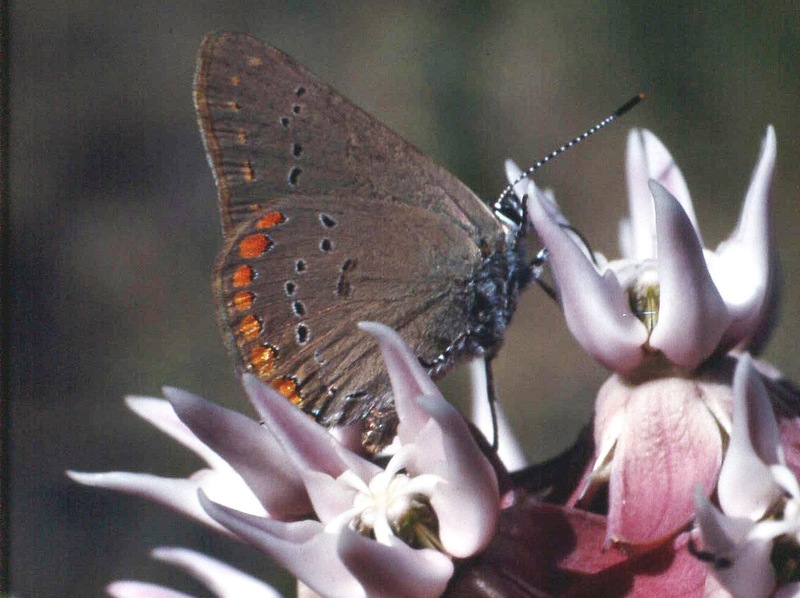 Butterflying can be excellent all along the Hart's Pass road, but the very special butterflies are at Slate Peak. Park your car in the parking area, then explore the ridges and meadows of the area. Make sure you pick a bright sunny day, for weather in the mountains can be unexpected. On even years the Astarte Fritillary (Boloria a. astarte) is in flight, and can be quite numerous. This very fast flying lesser fritillary is our largest Boloria species and can be easily identified by the ventral hindwing markings. Since it has a two year life cycle it flies only on the even years. (Euphydryas anicia howlandi) , and the Edith's Checkerspot (Euphydryas editha beani) will be nectaring on the meadow wildflowers . Both of these subspecies are restricted to the northeastern part of our state. tilted toward the sun. It sits so still and blends in with the rock so well that it is difficult to see. When dis- turbed it immediately takes flight and flies over the ridge out of sight. After a period of time it will return back to the ridge top. 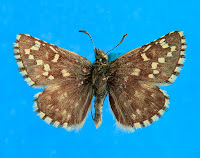 Our rarest skipper, the Grizzled Skipper (Pyrgus centaureae loki) flies in these high meadows. These black and white skippers can be seen nectaring on the mountain flowers. They are never common, but July seems to be their peak flight period. 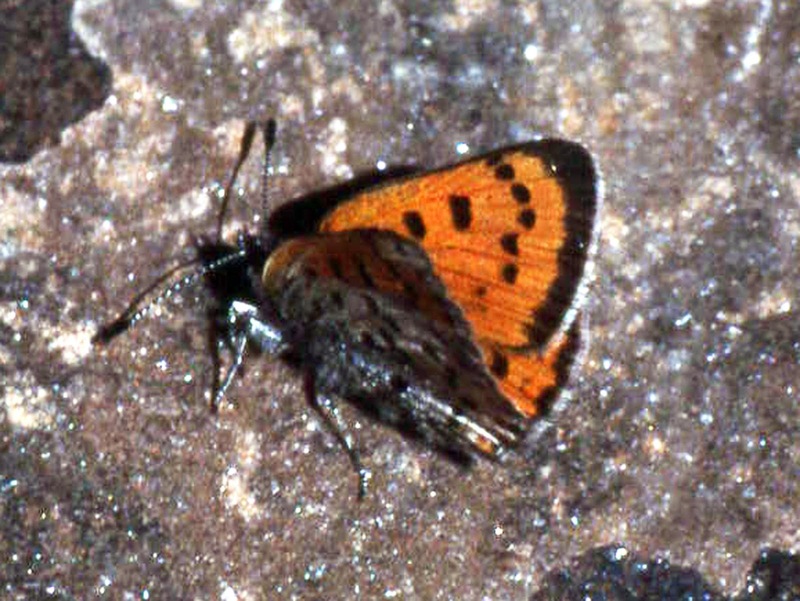 Another rare butterfly flies the north facing windswept ridges, the Lustrous Copper (Lycaena cupreus snowi). This butterfly seems to be more common in August, but could be seen from late July onward. The male sports a very coppery colored dorsal surface, but the female has a dorsal surface of orange and black spots. Look for it nectaring on flowers or perching on rocks. The Arctic Blue (Plebejus glandon megalo) that was discussed and pictured in the Olympic Mountain segment also occur here. It is relatively common flying along the ridge tops. Also the Western White (Pontia o. occidentalis) is a hilltopper here as well as in many areas of our state (for photo see the Olympic Mountains segment). My favorite swallowtail the Indra Swallowtail (Papilio i. indra) can be seen along the Hart's Lake road as well as in the meadows of Slate Peak. It is always a treat to see this beautiful swallowtail butterfly. Many other more common Washington butterflies seen also fly at Slate Peak. Enjoy these other butterflies as well as the special ones mentioned. 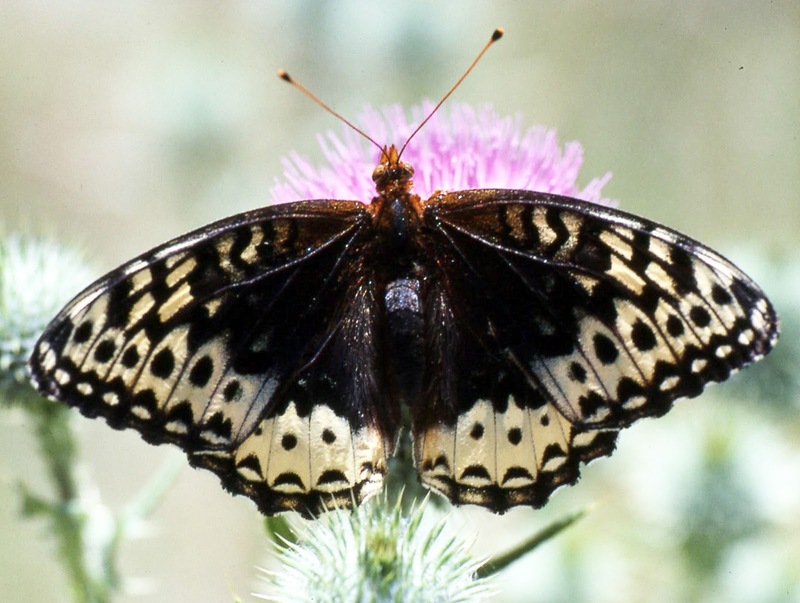 Salmon Meadows is another spot in Okanogan County where special butterflies can be seen. To get there drive to the town of Okanogan (near Omak). Take the Salmon Creek North Fork road to Conconully. Continue on through town and up the Salmon Creek North Fork Road for about eight miles to the meadows. Stop at flowered sites along this road for a variety of different butterflies. When getting to Salmon Meadows drive to the upper meadows for the best butterflying. From Conconully on up to the meadows be on the lookout for two of our special sulphurs. The large sized very yellow looking Alexandra's Sulphur (Colias alexandra pseudocolumbiensis) will be seen flying. This strong flyer may have to be netted to examine it properly. Flying with it is the smaller Pink-edged Sulphur(Colias interior). Three different greater fritillaries frequent the meadows and can be seen nectaring on the wildflowers. The Great Spangled Fritillary (Argynnis cybele leto) is our largest fritillary and can be easily distinguished from the other species of frits. This species shows sexual dimorphism with the males being orange but the females black with creme colored markings. 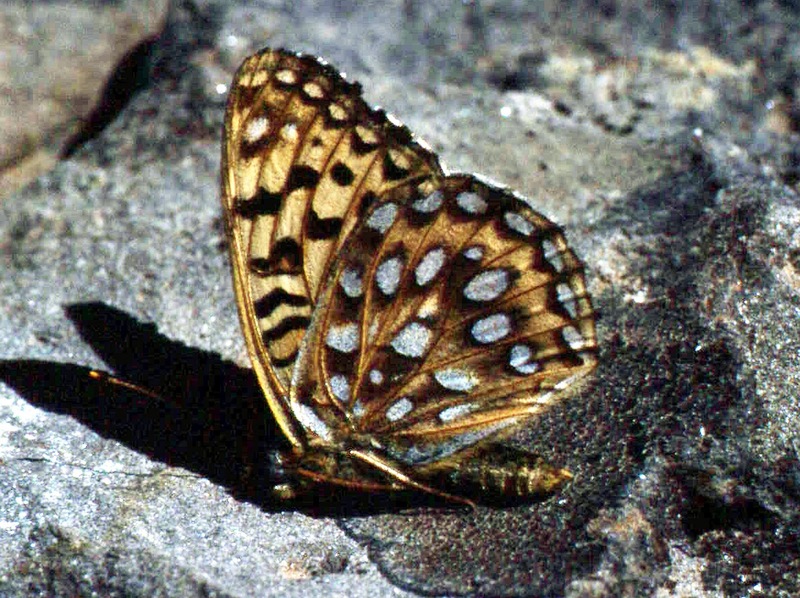 The Zerene Fritillary (Argynnis zerene picta) is also a large frit, but does not show sexual dimorphism. The large and numerous silver spots on the ventral hindwing is a good way to tell these two species apart. 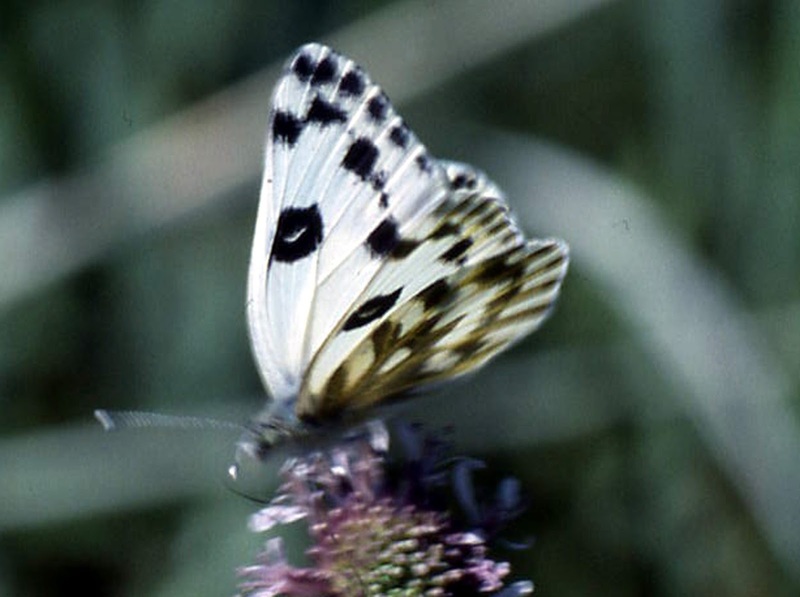 The third greater frit is much smaller and may posses silvered spots or unsilvered spots on the ventral hindwing. 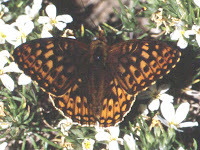 The Mormon Fritillary (Argynnis mormonia erinna) could be found nectaring alongside the other two species of frits. The other subspecies washingtonia can be seen flying in the Cascade Mountains. Many other commonly known butterflies will also be found in the meadows, including blues, coppers, whites, and other nymphalids. Have fun making a list of what you find. The third area I will cover is in our desert country of Grant County. Sun Lakes lie in a remarkable desert oasis. these pothole lakes are the remnant's of a once raging Columbia River that used this path to the sea during our glacial age. These isolated lakes and adjacent wetlands provide another unique area to study butterflies in our state. 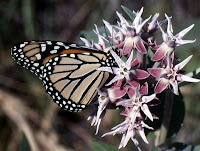 Here is a location in our state where one can find America's most well known butterfly, the Monarch (Danaus p. plexipus). To get to Sun Lakes take I-90 past vantage to George. Just beyond George exit on 283 (northeast) to Ephrata. You will merge with 28. Continue on 28 to Soap Lake. Continue north on 17 to Park Lake and Sun Lakes State Park. Make your first stop the wetland next to the state park campground. 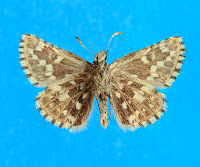 Here flies our rare Yuma Skipper (Ochlodes y. yuma). This is the only known area within our state that this butterfly flies. Its larval food plant is the large reeds (Phragmites) that line this wetland. Look among the reeds or on nearby flowers for the Yuma Skipper. Look through the park area then drive up the Deep Lake road. 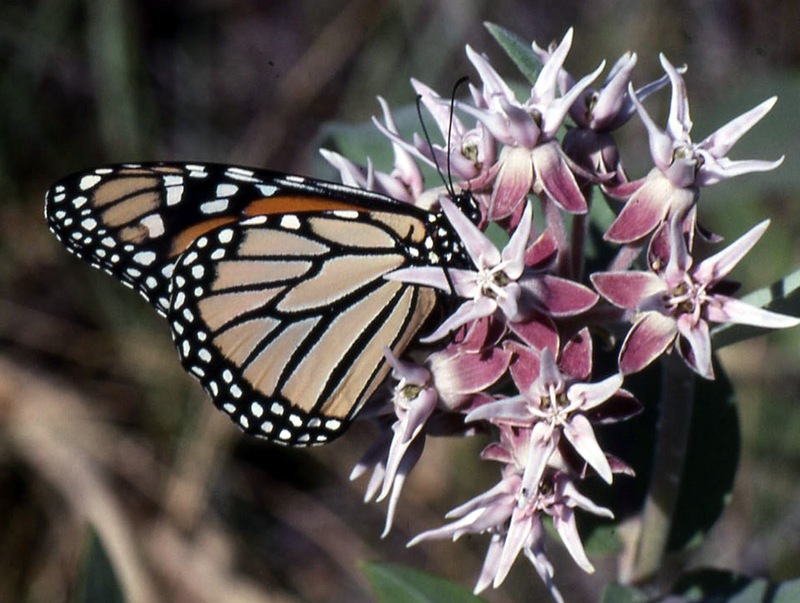 Spend time walking the wetlands, especially where the tall milkweeds are in bloom. Check the flower heads for several species of butterflies that love to nectar on these flowers. 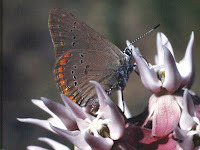 One notable species is the Coral Hairstreak (Satyrium titus immaculosis), which at the right time can be extremely abundant in the area. Also look for the Sylvan Hairstreak (Satyrium sylvinus nootka) on these flowers or where stands of willows grow. Another interesting butterfly flies in the Sun Lakes area where willow stands exist. 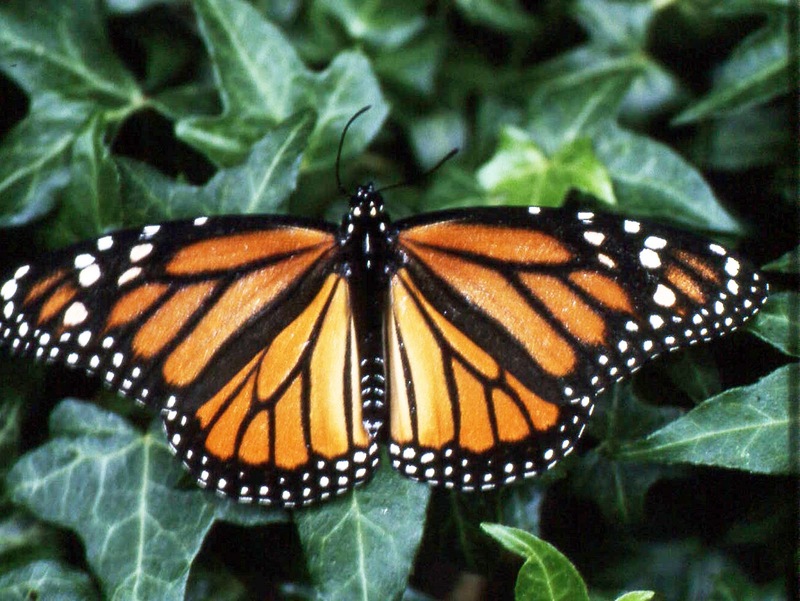 this species is the Monarch mimic- the Viceroy (Limenitis archippus idaho). 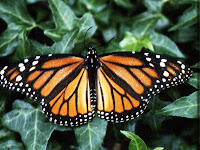 Even though it resembles the Monarch the distinctive black postmedian band on the dorsal and ventral hindwings distinguishes the two species. Sun Lakes is a good place to get a look at the summer brood of the Becker's White (Pontia beckeri). This is a given throughout the area . 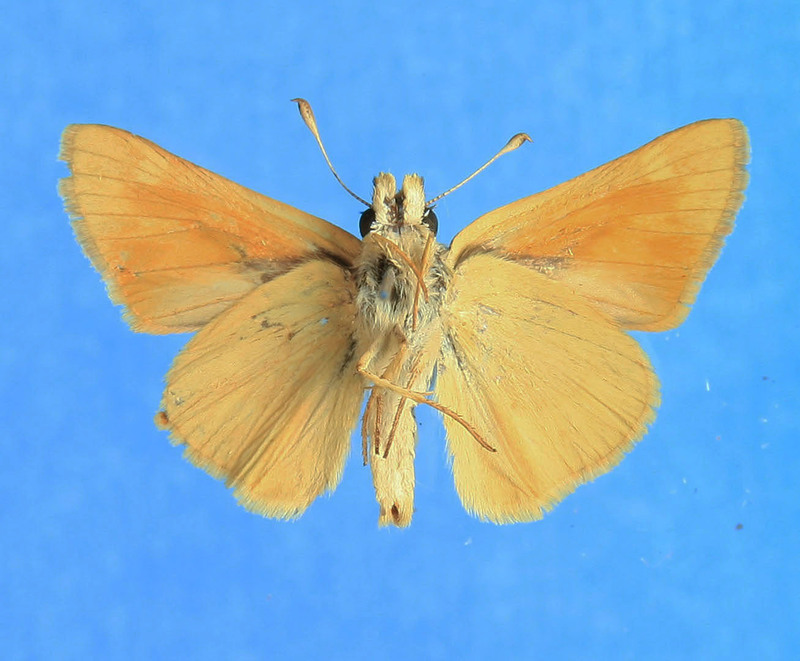 This species plus the Cabbage White will be the most common whites seen during July. If you drive up to the Delany Interpretative Center (on the way to Dry Falls Lake), spend some time walking around this wet area. You may be lucky enough to see the Silvered-bordered Fritillary (Boloria selene atrocostalis) flying around the wet areas. It is never abundant, but has been always present when visiting this area in July. Along the edges of any of the wet areas look for our beautiful Melissa's Blue (Plebejus m. melissa). Once again we see sexual dimorphism with the males a brilliant blue color and the females brown with orange bands. The Sun Lakes area is a ideal place to see our Old World Swallowtail (Papilio machaon oregonius). It first appears in July but becomes more abundant in August. On a Labor Day weekend I saw many of them flying through the state park area. 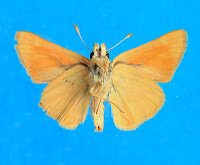 In August two skippers become abundant, the pale subspecies of the Woodland Skipper (Ochlodes sylvanoides bonnevilla), and the Sandhill Skipper (Polites s. sabuleti). Look for these in the grassy weed bearing areas of the park. Plan to butterfly in the morning hours, for often a wind comes up during the afternoon. Also watch out for rattlesnakes (however I have never seen one there) and step around the bunches of poison ivy that you see. The last area I will cover is the Griffin Peak area of the Blue Mountains (Columbia County). There are a few Washington butterflies that are restricted to the Blue Mountains. The Great Basin Fritillary (Argynnis eglais macdunnoughi) flies along the high rocky ridges near Griffin Peak. This is one of our smaller greater frits that is darker in color due to more black scaling. 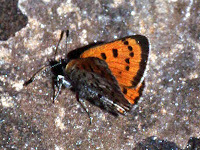 Also the Edith's Copper (Lycaena editha vucali) can be quite common in the high meadows. 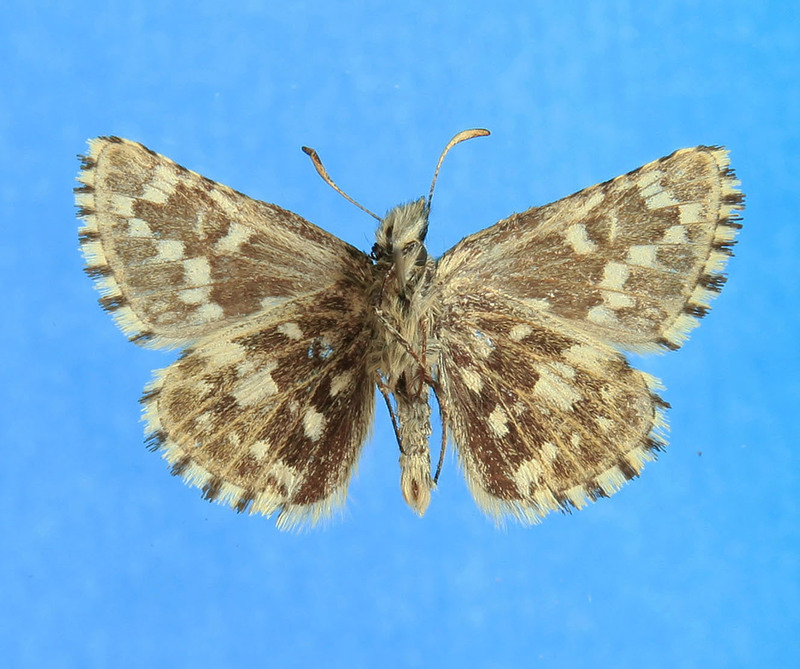 Our most black colored subspecies of the Snowberry Checkerspot (Euphydryas colon wallacensis) flies in this area. Look for them along the roads and paths in the high country. Many common Washington species also fly in these mountains with these three special ones. To reach the Blue Mountains take I-90 past Vantage and exit on 26 (toward Pullman). Exit 26 just past Othello and continue southeast to Dayton (17, 260, 127). From Dayton take the North fork of the Touchet River road to Ski Bluewood. Continue up on forest service roads to Griffin Peak. From there you can walk the high ridges and meadows.